What’s really living inside our vacuums? When it comes to cleaning your home, you probably don’t think of your vacuum cleaning as housing bacteria. Here’s a breakdown of the kinds of dirt that can live inside your vacuum. Most of us are set on autopilot when we’re vacuuming our home. We run through the motions without thinking about what we’re cleaning up or where it’s going. Plug in, switch on, use. Simple, right? But what about after we’ve used our vacuums? What happens to all the stuff we just picked up off the floor — or better yet, what did we pick up off the floor? Many of us go further still with this bad habit — not only are we unaware of what we’re cleaning, we’re unaware that we’ve left a pile of dirt sitting and festering in our vacuum, and in our home. If we consider the fact that vacuums don’t have an airtight seal preventing picked up particles from floating back out, we begin to start seeing the importance of realizing what’s living inside our vacuum cleaners. To find out what we’re all hosting inside our vacuums, we talked to online retailer vacuum-home.com. They tell us that you have to start by looking at what’s on the surface. And if you start thinking back to people and pet traffic, food spills, and odors — we start seeing what a creepy picture this really is. Your carpet is not as clean as you’d like to think. Even on an otherwise clean and healthy looking carpet, a close-up microscopic view of the surface would show legions of bacteria and micro-organisms scouring your carpet. If you start thinking about all the ways you use your carpet, you start seeing how troubling this can be. We enjoy our carpets by lying on it. Our children play on it. Our belongings fall or rest on it. Nearly everything in your home touches (or will touch) the carpet at some point — all of which underscores the importance of keeping your rugs, carpets and flooring clean. Scientists say that even in carpets without any reported damage, there is the very real possibility of indoor fungal growth. They determine this by the amount of carbon dioxide released into the air by micro-organisms living in your furnishings. Simply, they breathe, they release carbon dioxide, and high amounts of repeated releases can result in indoor fungus. In one study, scientists analyzed these organisms by sprinkling dust samples on a special filter. The result of this test “revealed 18 species were living in the carpets.” Their findings also showed a frightening similarity between what’s crawling around in your carpet and what’s crawling around in soil samples. Bacteria, fleas, mold and other microscopic organisms can all thrive in your carpet. But the number one thing that every home has is dust… and with dust comes the notorious dust mites. In collaboration with the EPA, researchers collected dust from vacuum cleaner bags in home, hotels/motels and at cleaning services. With a sample of collection from several states, scientists then filtered and analyzed the samples with test results confirming a minimum of 33 harmful toxins. Another test into this matter revealed over 80 harmful chemicals. Clearly, tests are showing that there are harmful contaminants living in your carpets and then transferred to your vacuum cleaner — where many of us leave them to thrive multiply and escape back into the air. So what exactly is in dust that is a living, breathing invader? Dust mites. The dust mites are microorganisms living on the dust particles, and they eat mainly dead human skin cells. And considering that sloughed-off skin cells comprise about 70 percent of all household dust, we quickly begin to see how we’re creating an environment in which dust mites can thrive freely… and begin to realize the hazards of not cleaning out our vacuums. Many people believe they have an allergic reaction to dust. However, the truth of the matter is that it isn’t so much the dust or dust mites you’re allergic to. The thing your sinuses are rattling in response to are dust mite excrement. Dust mites produce a ridiculous amount of droppings. 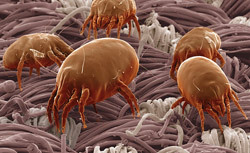 Considering they live up to 15 weeks, dust mites can produce up to 300 times their weight in bodily waste. Dust mites also lurk in bedding, drapes and feather pillows. Their by-products are so small that this excrement end up being part of the air in your house, which is one major cause of many typical allergic reactions. A high-quality vacuum cleaner will help reduce the level of dust mites, pet dander and other allergens in your home. The result: Your home’s air will be healthier for you to breathe, which is important even if you don’t suffer from allergies. When choosing a vacuum, select one with a HEPA (High Efficiency Particulate Air) filter to reduce airborne allergens. 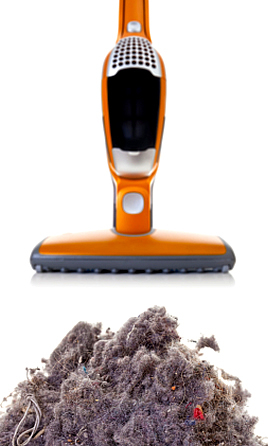 Research shows that HEPA vacuums do really cut down on dirt and dust much better than a typical vacuum. Vacuums with removable and disposable bags (as opposed to “bagless” vacuum cleaners) are preferred by many pet owners, because static electricity can sometimes make it difficult to clean pet hair from the plastic sweeper canisters. A vacuum with a rubber-tipped sweeper attachment designed to remove pet hair from furniture is also a good choice.